Kerala a state in Indian and placed in the southwest part of the country. Which has the Malabar Coast thus attracting many visitor and locals. The state has been in to existence since the 1956 and doing well in developmental matters. The state has high population and has equally divided the state in to 14 districts. Kerala state government has formed different departments and worked in making tasks easier for all the citizens. Indian being among the developed countries in the world has almost all it state digitalized and living to use the new technologies. Kerala state has different website portal. They can access various data using internet and not visiting offices for help. We have Kerala property tax online to discuss. The property tax matters have been address and are overlooked local and state government. They have the official website link which takes a lot of services in the state. The https://lsgkerala.gov.in link is a public portal where the tax and marriage, death and other services are dealt with. Citizens don’t have to visit offices to pay for their property rather they just login to the site and complete task online. Taking the property tax specifically falling under the Sanchaya Online Services which is a revenue and license system. The system has services related to property matters and runs the revenue system of the local government. What are the services carried out in tax.lsgkerala.gov.in? As discussed above the Sanchaya software built by the revenue department to hold various services in the Kerala state. They are: Property tax, Profession tax, Rent and land, License and building, Booking, Ambulance, Crematorium payments, Paying of water bills and Ownership certificate. Sanchaya takes all the duties of handling the Kerala property tax online. 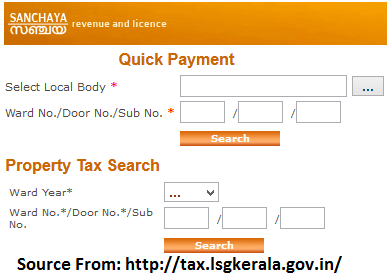 How do I Pay Kerala Property Tax Quick ePayment Online at tax.lsgkerala.gov.in? Initially the Kerala state citizens used to visit the revenue officials to register their property. It was alt of hassle since there were long queues and also a lot of corruption. This wasn’t enough the documentation was poor thus leading to the loss of documents. This lead the government introducing the Kerala property tax website which is known as the Sanchaya. Here property owners can register, change details and also make payments. It has made the situation much easier and one can open the link anywhere. We have the online procedure which is the most popular way to make payments. The new member will give some official details to help them proceed. Enter your district and corporation/ municipality of where you reside. A new page will open here you will be directed to property tax information / online tax payment. 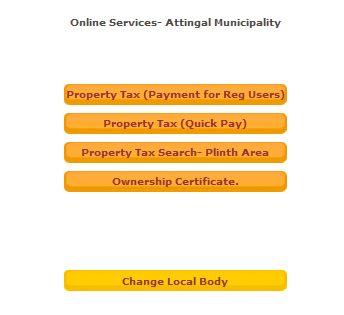 Click on the Kerala Property Tax payment, this option will request for the ward details. This the ward year and official number of the ward. Show the list of property: according to the ward number the list of property under the ward will show. Pick the property you wish to get details about. After this you will get the payment option from a list just at the bottom of this page. We have the demand tax where the property owner will have to pay online and the system will direct them to payment gateway. This are the credit card and the debit or the demand draft. Check the details again before making the payments. In confirmation make the payment and in few seconds the Challan will be produced. Using the Sanchaya website which is an e-governance software you can now receive the ownership certificate. This a major service under the Sanchaya site under the Kerala state government. When the page open select the district and corporation/municipality from the menu. The search button will be displayed click on it for the system to search for the corporation. A new page will open and here you find the ownership certificate option. Click on this option and the site will ask for your ward year, ward number and door number. Select the search button again and the system will open a new page with the owner’s details according to the ward number. The website will only show if you paid for the property tax to get the ownership certificate. If the payments are done now select the ownership certificate. A new page opens select the purpose of the ownership certificate. In few seconds the certificate will be produce but in PDF. After this you can print or download the certificate for future reference. Manage building list where you learn all the detail about your property.